mad orange fools: 10 years and a little contest. It's hard to believe that I have been doing this blog thing for 10 years. That's a long time. I don't think I've ever really celebrated the blog anniversary before, but I thought this year I would have a little contest, just for kicks. I actually started blogging in April of 2000, not July. I had a Pita called Shiny. 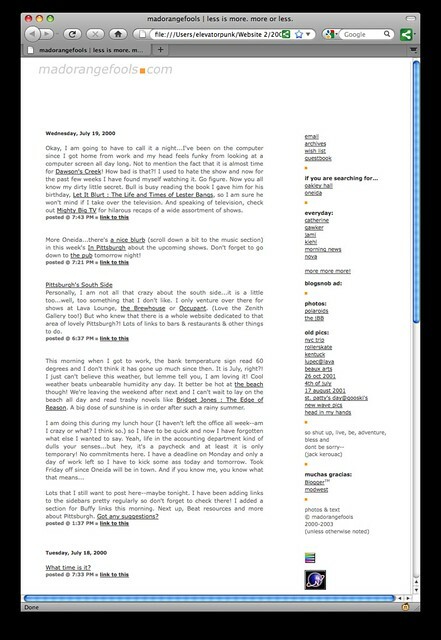 But it was sometime in July that I moved over to Blogger and purchased the domain madorangefools.com. That space has been dormant for quite awhile now, but nonetheless, the madorangefools has stuck and most of what I do on the internet is either madorangefools or just madorange. I'm not great at coming up with names and I remember struggling over what domain name to purchase. My choice was pretty random and so it's funny that it has stuck with me for an entire decade. I was hoping to find one of the first designs that I used, but alas, I couldn't find it in any of my website folders. I remember it being a really bright orange with red text or something along those lines. Pretty hideous, I think. After that, I pretty much stuck with white as a background and simple headers. I'm all about simplicity. So here's the deal with the contest. 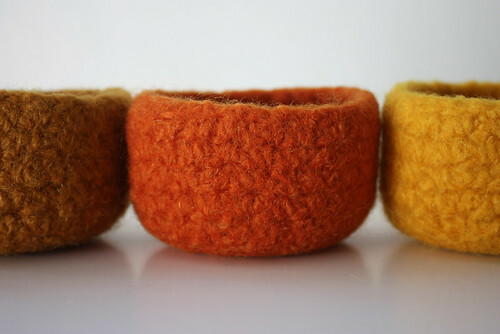 The first person who can tell me where I got the phrase "mad orange fools" wins this lovely set of 3 tiny felted bowls. The answer that wins will be the one with the most detailed information. There is an easy answer which I am guessing some of you know. If no one gets the whole answer, then the names of everyone who leaves a response will be put into a hat and a random winner will be selected. The contest will run through Saturday, July 31st and I'll announce the winner on Monday, August 2nd. 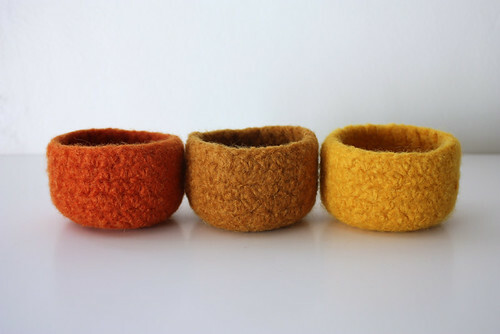 The bowls were hand crocheted with a 85/15 blend of wool and mohair, then wet felted in the washing machine. 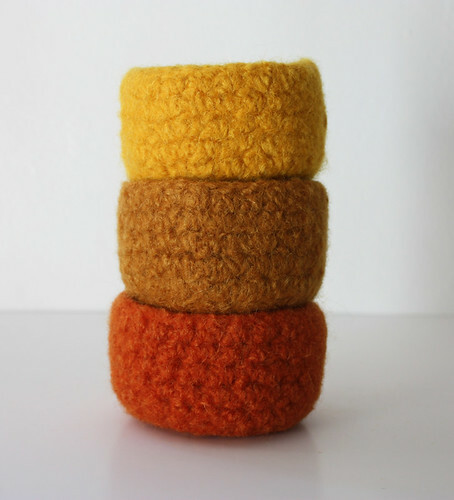 Each bowl is approximately 3" wide by 1.75" high. So I am hoping this will be fun and that you will play along by putting in your answer. I have to admit that the last time I posted a giveaway here, I didn't get any response and it was a little disheartening. But that was then and this is now. Here's hoping that it works this time! I have the comments open to anyone so you don't have to sign up for anything to leave a response. Just remember that if you comment anonymously, you need to leave some clue in the comment as to who you are and/or how I can contact you if you win. without cheating and double checking (and thus setting myself up to be wrong), I think it was from Kerouac - perhaps *On the Road* (?? ok the book is a guess, but you wanted specifics). i used to know more but I am old and forgetful. hmm -you chose the quote after an especially unfortunate self tanning episode (hahaha - joking). "Meanwhile the sunsets are mad orange fools raging in the gloom ..." Kerouac, Desolation Angels, I believe.